Passiflora (Passion flower) is a pleasant plant. We couldn't resist taking our Nelumbo/Nymphaea 50x resin extract and adding just a few dashes of Passiflora into the mix. 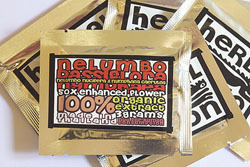 Some like this less than the pure Nelumbo/Nucifera blend, and some say this is noticeably more effective and intense in its scent and resulting pleasurable effects.